Welcome to another edition of Po Politickin. In this episode, we politick with San Diego rap veteran Mitchy Slick. Slick is a solo artist and one-third of Stones Throw Records hip-hop trio Strong Arm Steady. Founder and CEO, Slick branded Tha Wrongkind, a familial collective of artists, producers, deejays and entrepreneurs. Slick spent his formidable years in the southeastern division of San Diego, namely the Lincoln Park area. He later attended Prairie View A&M in Prairie View, Texas and returned to his hometown in California, where he embarked on his musical career. Mitchy was featured on Gangland about the San Diego Lincoln Park Bloods, a gang he associates with. Slick’s debut album, Triggeration Station was released in 2001 and peaked at #13 on Billboard’s Top Independent Albums chart that same year. Since his debut, Slick has released numerous mixtapes including the XXL Guns collection, Mitchy Duz It, Strong Arm Robbery 1 & 2 and his sophomore album Urban Survival Syndrome. Along with Los Angeles emcees Krondon and Phil the Agony, west coast super-group Strong Arm Steady released its debut album Deep Hearted in 2007 followed by the mixtape Gang Mentality, the conceptual album In Search of Stoney Jackson, followed by Arms and Hammers, and most recently Stereotype, a collaborative album with producer Statik Selektah. 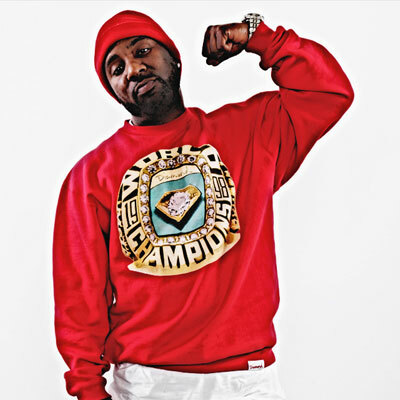 In addition to mixtape appearances and both group and solo recordings, Slick has also collaborated with notable industry figures such as Gladys Knight, Lil Wayne, Waka Flocka Flame, Xzibit, The Game, Talib Kweli, Trae tha Truth, Paul Wall, Menace, The Jacka, Jay Rock and E-40. In 2007 Slick and bay area rapper Messy Marv released the joint effort, Messy Slick which landed on Billboard’s Top R&B/Hip-Hop Albums chart during the week of July 14, 2007. In early 2010, Slick and Tha Wrongkind released the Yellow Tape compilation followed by the Wrongkind Is Everywhere mixtape in 2012 presented by DJ Rah2k. In 2013, Mitchy Slick returned to the hip hop scene with a bang with the release of two solo albums entitled Feet Match the Paint, with The World’s Freshest aka DJ Fresh, and Won’t Stop. 2014 is expected to follow the same formula with Slick already releasing his “Call of Duty: South East” EP on January 13th for free download and has plans of turning into a full-length LP in the very near future. With other solo projects, Gang Intervention and Lost in the Bay, in the pipeline, Slick has also announced that he will be releasing collaborative projects with Black Wall Street’s Compton Menace, Brick Squad’s YG Hootie, and The Whole 9.2 EP with his own Youngkind artist OsoOcean this year as well. One thing is for sure, though, after 10+ years of independent rap hustlin’, Slick has no intention of slowing down until he and Tha Wrongkind claim their spot in the upper echelon of the hip hop industry. Mitchy’s latest project – Call of Duty: South East.